Jurors spent a second day in deliberations Wednesday in the corruption trial of former Virginia Gov. Bob McDonnell and his wife, Maureen. The McDonnells are charged in a 14-count indictment with accepting more than $165,000 in gifts and loans from former Star Scientific Inc. CEO Jonnie Williams in exchange for promoting his company's nutritional supplements. "All I can say is God's mercies are new every morning and I wake up every day just filled with hope and I'm ready to be done," said Bob McDonnell as he entered the federal courthouse in Richmond on Wednesday. McDonnell may be ready to be done, but the 12 jurors deciding his future and that of his wife aren't ready to deliver a verdict. Jurors are considering five weeks of testimony and scores of exhibits. They began Tuesday and worked at it for more than five hours before quitting for the day. They returned Wednesday to spend another day in deliberations. The McDonnells came and went from court Wednesday separately, joined by one or more of their children. Court observers say it's no surprise there hasn't been a quick verdict. "This is going to be one of the more complex criminal cases that this courthouse has seen in the sense that you have so many witnesses, so many piece of testimony," said Charles James, a defense attorney who handles federal cases in Richmond, "and you have co-defendants, so the jurors are really going to have to work through that and work through the competing testimony." James says the fact that there are two defendants, each facing 13 charges, only adds to the challenge. Still, for those who've have been consumed by this case for months, these are undoubtedly anxious days. "Whether you are the defense or the government, you've thrown the last year and a half of your life at this case and you are invested in it personally and professionally, so [it's] safe to say both [are] anxiously awaiting a verdict and on pins and needles," James said. Defense attorneys have suggested that the McDonnells' marriage was falling apart, and they couldn't have conspired with each other to get the gifts and loans. Bob McDonnell moved out of the couple's home a week before the trial began. Maureen McDonnell's attorney said the first lady developed a "crush" on Williams, and her eldest daughter testified in her mother's defense about the difficulties the couple faced, and her mother's "mild obsession" with Williams. During testimony, Bob McDonnell testified that he didn't do anything special for Williams in exchange for the gifts and loans. 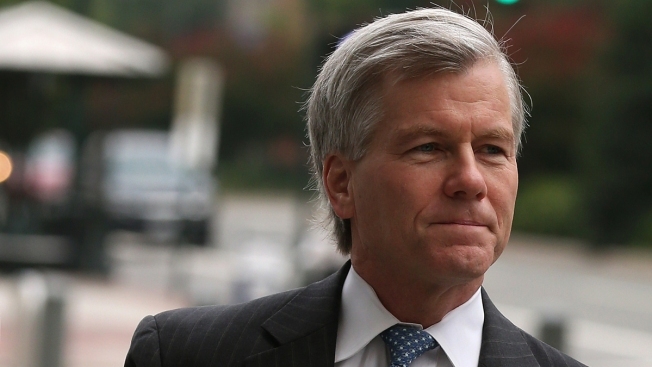 The former governor's defense argued, "The federal government has not produced any evidence, least of all that Bob McDonnell committed bribery or defrauded a bank." Williams testified under immunity that he spent money on the McDonnells solely to get their help promoting his product Anatabloc. Prosecutor David Harbach told jurors, "This is fundamentally a simple case.... The single, simple question is, why? Why did [Jonnie Williams] give [the gifts and loans]? Why did [Bob McDonnell] take them?" The answer, Harbach said, was the McDonnells were badly in debt, and Williams was willing to provide help if they would promote his tobacco-based supplement, Anatabloc. "That is bribery. That is corruption ... the real thing," he said. Bob and Maureen McDonnell each face 13 charges. Although the indictment includes 14, one charge applies only to Bob McDonnell and another applies only to Maureen McDonnell. They each face one count of conspiracy to commit honest-services wire fraud, three counts of honest-services wire fraud, one count of conspiracy to obtain property under color of official right, and six counts of obtaining property under color of official right. Bob McDonnell also faces two counts of making false statements, while Maureen faces one count of making false statements and one count of obstruction of official proceeding. They could face decades in prison if convicted.